"The Ride was derived from the base origins of the Park, but with more focus on a 'sheet in and go' feel and water relaunch ease. Our R&D team set out to create a kite that was simple, easy and fun for 'all around, hooked-in freeriding'; and a kite that a novice or entry level rider could use for learning the basics and improving into an advanced rider. The rounded wing tips allow the kite to better rotate with less drag while resting on the water, which makes relaunching extremely easy. The two-strut design allows for a lighter weight kite with a more full center section. This design, coupled with a slightly flatter arc (compared to the Park) allows the Ride to get more punch when sheeting in, giving it that nice sheet in and go feel. The Ride's design characteristics translate into very easy jumping, where the rider can simply sheet in and jump on demand, without having to over think kite positioning. The Ride really hits the mark for the target rider and our R&D team is very proud of the end result." Bar adjustment from 18" to 20"
The Ride was derived from the base origins of the Park, but with more focus on a 'sheet in and go' feel and water relaunch ease. 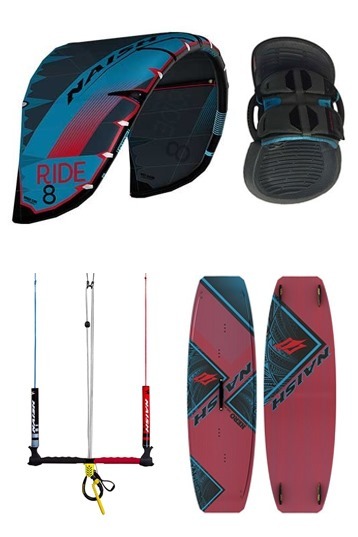 Our R&D team set out to create a kite that was simple, easy and fun for all around, hooked-in freeriding; and a kite that a novice or entry level rider could use for learning the basics and improving into an advanced rider. 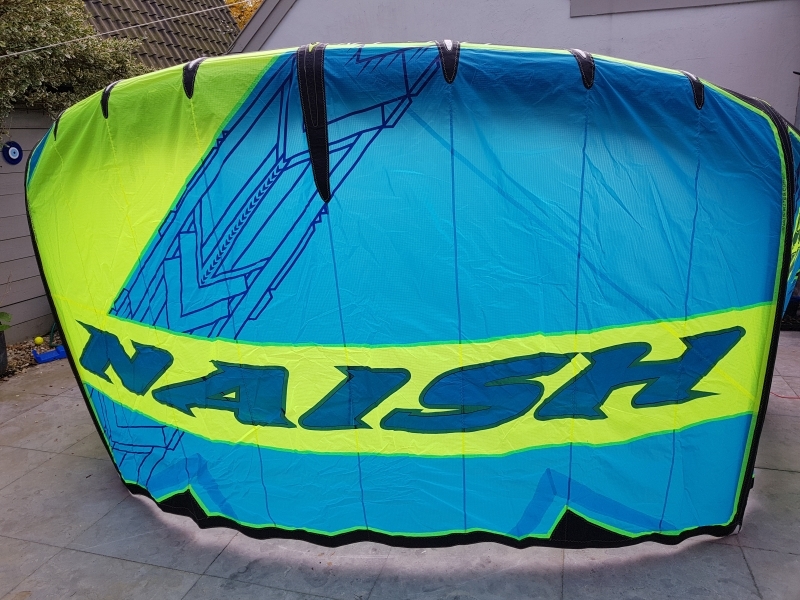 Finally, Naish has a great starters kite! This one's really on the spot! Great characteristics for beginners like its relaunch, depower, stability and lots of feedback. It's not too fast and a lack of pop and boost give a starter the room to make some mistakes. In the lower end of the wind window, it's really easy to steer this kite, which is really important for a starters kite. 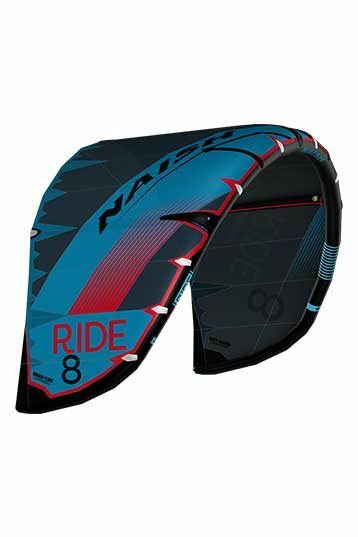 Intermediate riders that will jump with this kite will really enjoy its sheet and go feeling, while intermediate wave riders will like the drift of the Naish Ride. Nice one! Great kite for its purpose! Great on the bar, easy sheet and go with total depower. Quick release safety kite opens all the way! 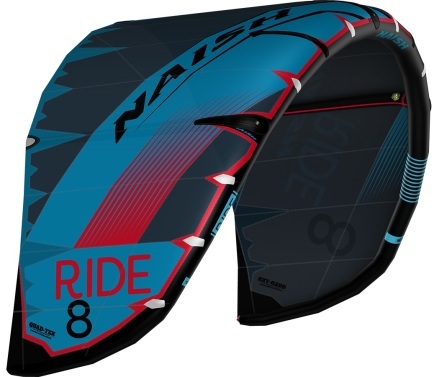 The Naish Ride is à easy kite. Great power control from the first minutes airtime. It is Pretty soft. Lift is gentle and boost is hard to find. The 10m is à easy going kite also in 5 bft, pull the bar and off you go. Power and depower all controlled on the bar, sheet in, sheet out, have fun.